On this complete re-roofing project at various stages it’s necessary to complete the leadwork required under the building codes of practice to weatherproof and protect the fabrics of the roof. Approximately 1 day to complete the hand work to create this back gutter to the existing chimney. This image shows the new lead back gutter installed and ready to finish slating around the chimney. This piece of lead was measured and cut to suit the angle and fall of roof then welded so it could slot into place. This is a highly skilled process and if not done correctly it will put more stress on the lead, it will not be thinned by beating and bossing in the wrong places therefore lasting for many years. 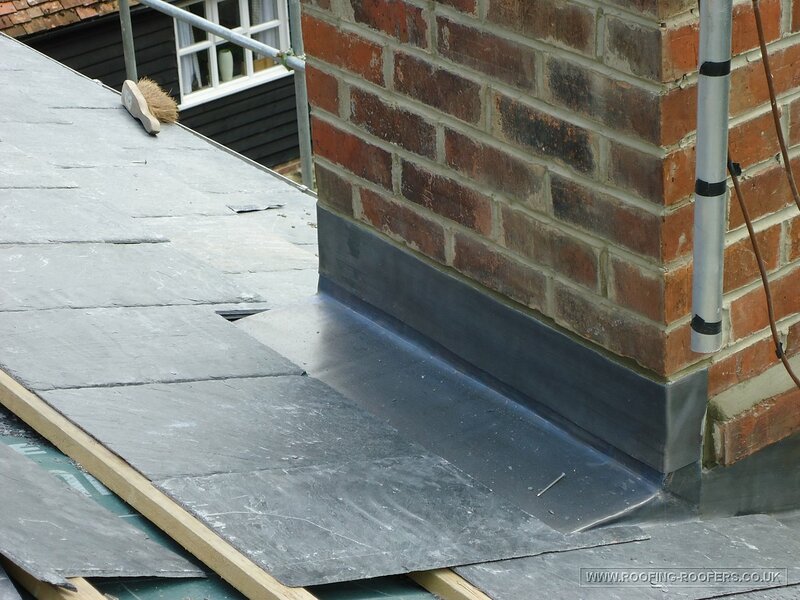 A separate cover flashing is installed over the back and into the brick mortar. Click the image to enlarge and view the craftsmanship employed in more detail. This entry was posted in Chimneys, Leadwork and tagged Chimney repairs, leadwork by admin. Bookmark the permalink.